Most articles you read will tell you that you need to go high for a break near the end of the season. Although there is an element of truth to that, there are other things to consider for an Easter break. Is it a resort which is over-popular (especially with locals) at this time of year? Is there anything else to do once you have stopped skiing? What happens if it does dump with snow? Obergurgl is one of the top resorts in the Tyrol in more senses than one. With the main village lying just under 2000 meters in altitude it is pretty much guaranteed to have late-season snow. It never tends to be overcrowded (day-trippers up the valley usually stop off at the closer resort of Sölden and its glaciers) and, although there is little to do outside skiing, hotels are of a high standard with plenty of facilities. Zell am See is the kind of resort that you wouldn’t see on a normal report about late-season skiing. So why does it make the Ski-Austria cut? Mainly because it is a lively active town in a gorgeous setting on a lake and with glacier skiing close by at the Kitzsteinhorn. Sure, Kaprun is closer and yes, other resorts also have glaciers within reach. But Zell hits the spot for combination of assured late-season skiing and plenty to do when you are not on the slopes. Lech is famous for its exclusivity and upmarket clientele – but it also benefits from its elevation and from the uncrowded and extensive ski areas. There is no glacier in the area, but the top slopes are high enough to hold the snow late into the season, and the circuits available between Lech, Warth, Zug and Zürs offer different exposures to the sun. There is nothing much to do in the pretty village, but the accommodation is generally of an extremely high standard with plenty of facilities. 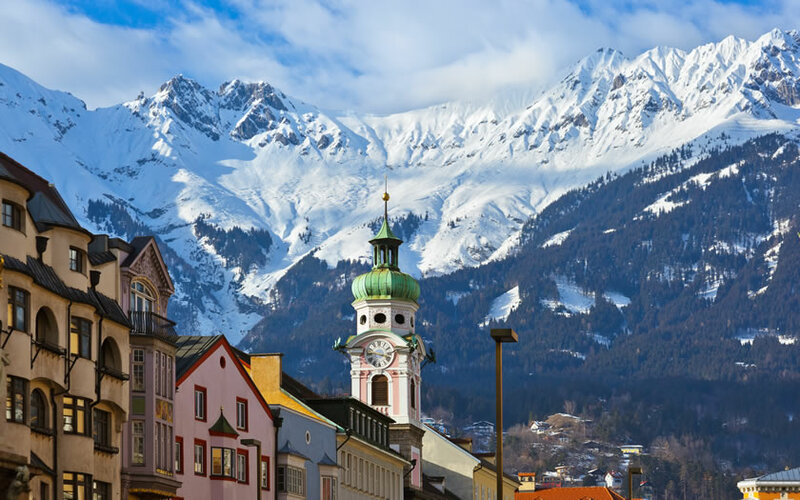 Some might find Innsbruck a bizarre choice for a ski vacation at Easter. But the city has good access to glacier skiing in the Stubai valley (available on a local ski pass) and to the high Kühtai area (also available on the pass). And if late snow does arrive, then there are plenty of other resorts included to sample – nine on the local ski pass. Added to that, Innsbruck offers plenty for the non-skier or activities in the afternoon and skiing. And it is of course eminently situated for air travel. Obertauern is another of Austria’s high resorts and is possibly the closest in nature to its rivals in France, although Austrian purpose-built accommodation still tends to be more attractive than its western counterpart. Slopes start outside the hotels and apartments, and it is at a high enough altitude that if Obertauern doesn’t have snow, then only the glaciers will have. The resort is friendly but lacks a central area, being spread out along the main road over into the southern part of Austria.